No day is so bad that it can't be made better with a nap. A good night’s sleep does wonders. You wake up alert, full of energy, and ready to face the day. ‘No day is so bad that it can’t be made better with a nap’ wall words remind people to take things easy when they have had a bad day. A nap will make you see things from a different point of view. Its healthy! ‘Sleep in peace ~ God is awake’ are very comforting wall letters. They remind you to trust God and not worry about anything because God watches over us round the clock. These are fitting words to have in the bedroom: you are guaranteed of having the best rest ever if you cast your cares to God. 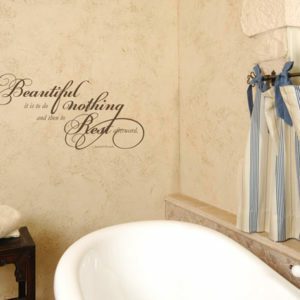 At WiseDecor we have wall quotes that are suitable for the bedroom. They are easy to apply and last long. They are also easy to remove and reapply onto a different spot. Our wall lettering comes pre spaced. We have an excellent team of designers who do all the work so that you’ll have time to enjoy your new decor. If you are looking to decorate your bedroom with something unique and calming, choose a quote on sleep and rest. Our wall decals are available in different colors. This means that you’ll have accents that tie in well with the rest of the decor. Get in touch with us and let us us help you decorate your bedroom.